In the depths of a freezing winter in Kyrgyzstan a young woman is found lying in the snow, sliced open to reveal a foetus. Inspector Akyl Borubaev of Bishkek Murder Squad is appalled at the crime, which takes a political turn when the woman is identified as the daughter of the Minister for State Security, a powerful and lethal man. Borubaev is tasked with finding the woman’s killer quickly and discretely and canons into the Kyrgyz underground seeking answers. Using threats and violence it’s hardly subtle policing, but he picks up a trail and discovers that the woman is not the only victim and that others are also searching for the killer. Talking to Borubaev, however, is a costly business, his witnesses also becoming victims. Even if he succeeds in finding the killer, he might not have a case, and there’s a good chance he won’t survive either. It would not surprise me in the slightest if A Killing Winter has been banned by the Kyrgyzstan tourist board as it paints a dismal picture of the country – high-levels of state corruption, strong criminal gangs and a crime-ridden society, crippling poverty, wide scale drug and alcohol abuse, and terrible, freezing weather. From a crime fiction perspective, it’s certainly an interesting setting, however, especially with a protagonist who believes in law, order and justice, and utilising intimidation and violence to achieve those ends. Inspector Akyl Borubaev of Bishkek Murder Squad is a complex character with a moral compass pointing in roughly the right direction, though he turns a blind eye to the worst excesses of his colleagues and to the criminal elements of his family. Recently widowed, his sense of self-preservation is also a little skewed. It needs to be to solve a series of brutal murders – this is not a book for the squeamish or faint-hearted – and take on the killer. 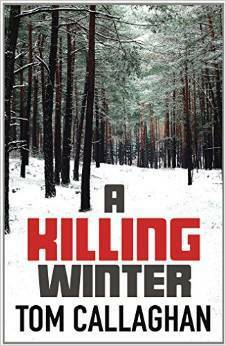 Right from the start Callaghan employs vivid violence and then counterpoints it with pathos in a series of quickly moving switchbacks to create an engaging police procedural thriller. The plotting is nicely done, with the investigation constantly shifting gears and direction as Borubaev chases shadows and motive, leading to a nice denouement. Beyond some sentences designed to shock rather than simply tell the story, my main issue was I couldn’t work out why Borubaev was alive at the end of the book; it made no real sense when witnesses and others were being killed not to also dispose of him. Otherwise this was an evocative, pacey tale and the start of what I think should be an interesting series featuring Borubaev. Thank you for your honest, clear assessment. When you say that book is not for the squeamish, when point to what sounds like gratuitous violence, and when you puzzle over the loose-threads at the end (i.e., the character's survival against all odds and reason), then you provide a great service: I can now avoid the book. I confess to being no fan of gratuitous violence in crime fiction, so common on contemporary writing. And I also wonder: Who are your favorite contemporary authors (i.e., those not cashing in on over-the-top violence)? All the best from new blogger. David. David, I do think the book was a good read, and some of the violence is contextual to the story, but there's no hiding that it is very violent at time. In terms of reads without over-the-top violence my full list of book reviews cover a fairly wide spectrum of crime fiction. I find picking favourites quite difficult, but these spring to mind: James Sallis, Adrian McKinty, Arnaldur Indridason, Maj Sjowall and Pers Wahloo, Ann Cleeves, Alan Furst, Malla Nunn, Ben Pastor, R.D. Wingfield, Megan Abbott. Thank you for your nice response and the reading recommendations. I am familiar with some (e.g., Cleeves and Indridason) but need to fill-in-the-blanks of my reading by sampling the others. In my new blog, I hope to apply an historical, analytical approach to critiquing crime fiction. My first posting ponders Poe's 1841 short story ("Murders in the Rue Morgue"), which I will write about more in the next posting, and I hope you will visit every now and then; if you will occasionally share your extensive knowledge of the genre, you will help me quite a bit as a navigate through the history.